A Korean-American woman drifts from Yale into a job as a private investigator. 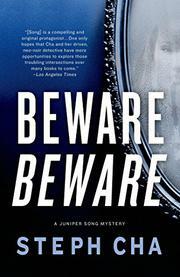 Juniper Song’s efforts as an amateur sleuth got her best friend killed (Follow Her Home, 2013). Now her friend Chaz Lindley, who’s also her boss at the firm where she’s working as an apprentice, gives her a case of her own. New York artist Daphne Freamon wants Song to keep an eye on her boyfriend, Jamie Landon. Jamie’s working in Los Angeles as a writer for movie star Joe Tilley, and Daphne finds some of his behavior suspicious. Tailing Jamie tells Song that he spends a lot of time partying and probably dealing drugs. When Tilley ends up dead, wrists slashed, in the bathtub of a Hollywood hotel, Jamie, the only one left in the suite after a wild party, becomes a person of interest. After Daphne flies in from New York, the relationship she and Song were building on the phone becomes stronger as Song tries to help Jamie. Problems erupt in Song’s own life when her roommate, Lori, whom she considers almost a younger sister, is suddenly pursued by a dangerous gangster who has some hold over her uncle. Song turns up information about Daphne and Jamie’s past that raises doubts in her mind about the roles they are playing in Tilley’s murder, but she still trusts the charismatic couple. Even after Daphne breaks up with Jamie once he’s arrested for Tilley’s murder, she still pays Song to prove him innocent. Song’s efforts in both cases get her in trouble, but like her idol Philip Marlowe, she’s determined to do the right thing. Danger, moral ambiguities, noir atmosphere and twists a snake would find hard to follow abound in this cautionary tale.